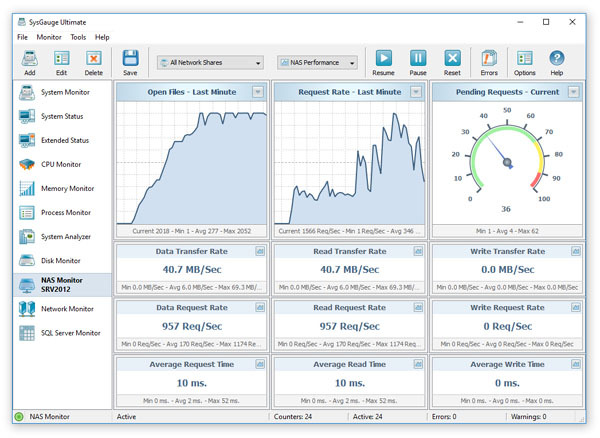 6-Feb-2019 - SysGauge v5.8 adds a server-based product version, named SysGauge Server, which runs in the background as a service and allows one to monitor a number of remote computers simultaneously. The SysGauge server can be controlled locally or via the network using a dedicated client GUI application or the SysGauge command line utility. In addition, the new version improves the main SysGauge GUI application and fixes a number of bugs. 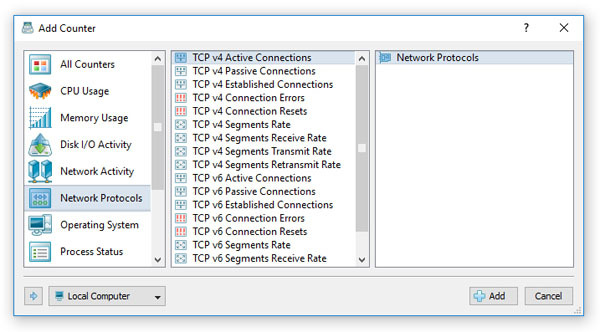 15-Jan-2019 - SysGauge v5.7 adds the ability to configure conditional rules, actions and E-Mail notifications for all types of TCP/IP protocol monitoring counters allowing one to automatically detect abnormal network activities. In addition, the new product version improves the SysGauge command line utility and fixes a number of bugs. 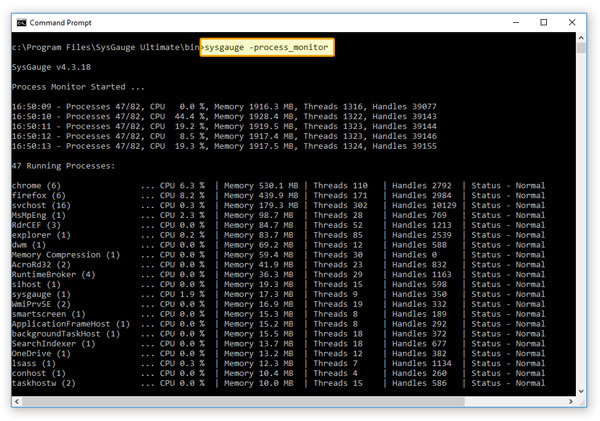 20-Dec-2018 - SysGauge v5.6 adds the ability to export custom system monitoring profiles to the XML format and then use the SysGauge command line utility to monitor multiple target computers via the network. 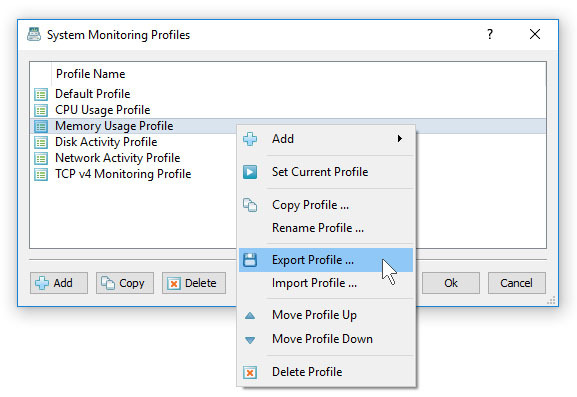 In addition, the new version adds the ability to import custom system monitoring profiles from previously exported XML files, improves the SysGauge main GUI application and fixes a number of bugs. 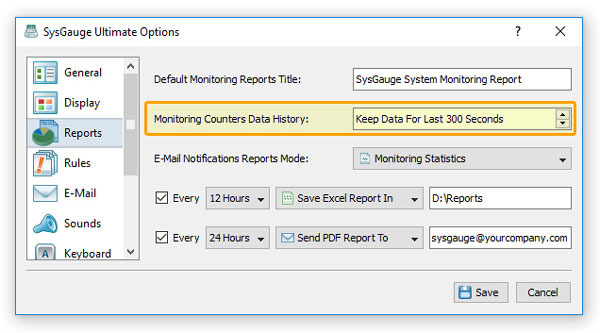 10-Dec-2018 - SysGauge v5.5 adds the ability to control how much of the system monitoring data is kept in the system memory and how much data is saved to all types of system monitoring reports. 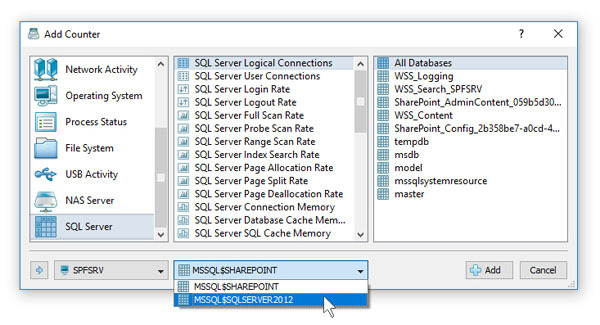 In addition, the new product version adds the ability to perform a silent product installation procedure, improves the SQL database monitoring reports, improves the SysGauge command line utility and fixes a number of bugs. 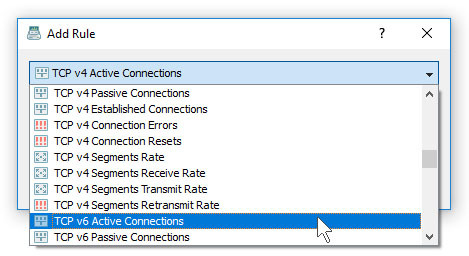 26-Nov-2018 - SysGauge v5.4 adds the ability to monitor the TCP/IP protocol activities including the number of active TCP/IP connections, number of passive connections, number of established connections, number of connection errors, number of connection resets, TCP/IP segments rate, receive segments rate, transmit segments rate and retransmit segments rate. In addition, the new product version improves the system monitoring profiles dialog and fixes a number of bugs. 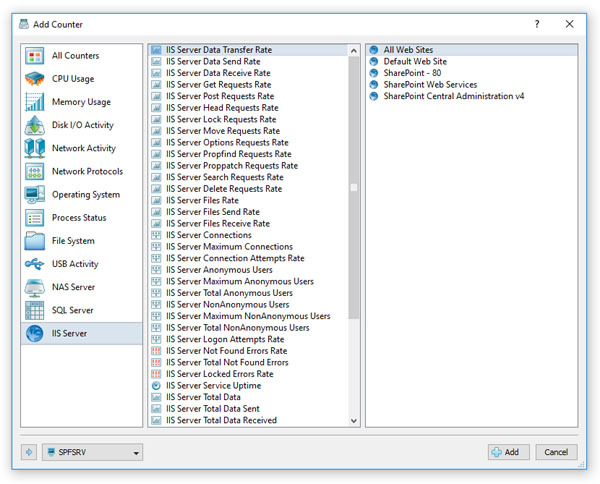 5-Nov-2018 - SysGauge v5.3 adds the ability to configure process monitoring rules and policies allowing one to automatically check that the amount of system resources consumed by one or more designated processes is within the user-specified limits and send E-Mail notifications or execute custom actions if designated processes are not running or consuming too much of the system resources. In addition, the new product version improves the main SysGauge GUI application and fixes a number of bugs. 13-Sep-2018 - SysGauge v5.2 redesigns the SQL Server monitor allowing one to easily switch between multiple SQL Servers. 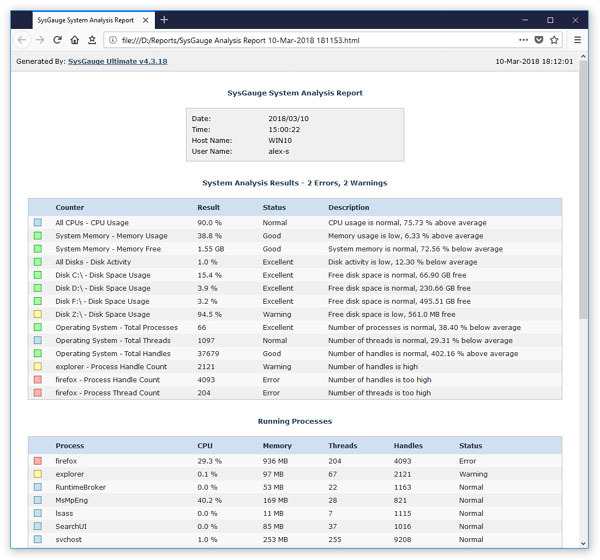 In addition, the new version improves the SysGauge command line utility, improves all types of system monitoring reports, improves the NAS server monitor and fixes a number of bugs. 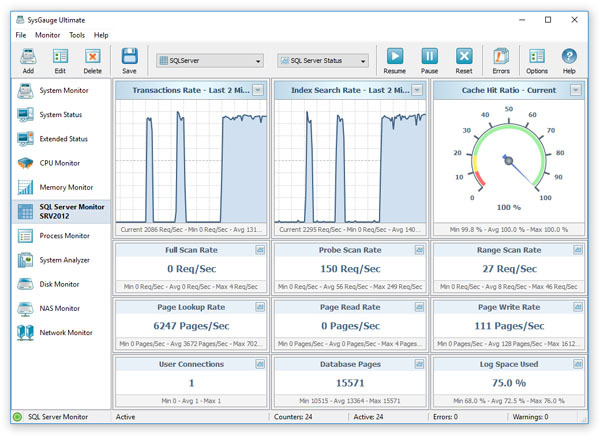 28-Jun-2018 - SysGauge v5.1 redesigns the NAS server monitor and adds the ability to monitor the open files rate, NAS meta data rate, average NAS request time, average NAS read time, average NAS write time, average NAS request size, average NAS read request size, average NAS write request size, average NAS data queue length, average NAS read queue length and the average NAS write queue length. In addition, the new product version adds the NAS monitor statistics view and fixes a number of bugs. 19-Jun-2018 - SysGauge v5.0 adds the ability to monitor the average disk request time, average disk read request time, average disk write request time, average disk request size, average disk read request size, average disk write request size, average disk queue length, average disk read queue length, average disk write queue length and the current disk queue length. In addition, the new version adds a disk monitoring statistics module, improves the SysGauge GUI application and fixes a number of bugs. 10-May-2018 - SysGauge v4.9 adds the ability to monitor multiple SQL Server instances installed on the local computer or a number of remote computers via the network. In addition, the new product version adds the ability to monitor one or more local or remote SQL Servers using the SysGauge command line utility, improves the SQL Server monitoring reports, improves the NAS server monitoring counters, improves USB monitoring counters and fixes a number of bugs. 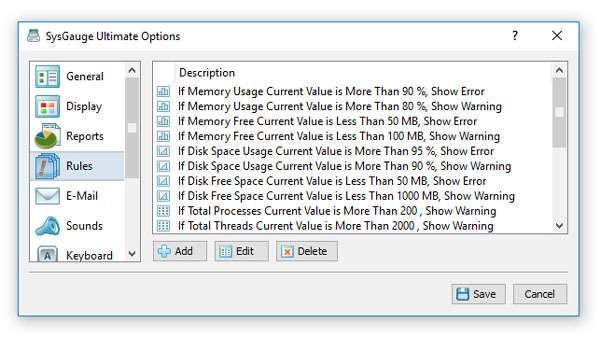 3-May-2018 - SysGauge v4.8 adds the ability to monitor the SQL Server total memory, SQL Server free memory, SQL Server cache memory, SQL Server log pool memory, SQL Server work space memory and SQL Server target memory. In addition, the new product version improves all types of system monitoring reports, improves the SQL Server monitoring GUI and fixes a number of bugs and security vulnerabilities. 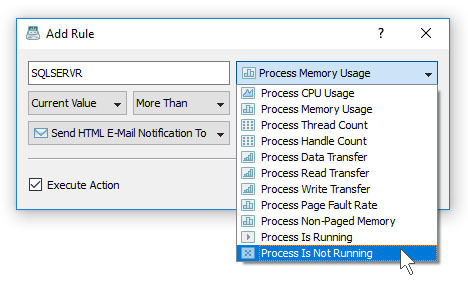 24-Apr-2018 - SysGauge v4.7 adds the ability to export the CPU usage per process, memory usage per process, the number of threads per process, the number of handles per process, the page fault rate per process and the data transfer rate per process to the HTML, PDF, Excel, text, CSV and XML reports. In addition, the new product version fixes a number of security vulnerabilities and bugs. 3-Apr-2018 - SysGauge v4.6 adds the ability to monitor one or more Microsoft SQL Servers locally or via the network. In addition, the new product version adds NAS server monitoring rules, adds SQL server monitoring rules, improves system monitoring reports and process monitoring reports. Finally, the new product version fixes a number of bugs and security vulnerabilities. 22-Mar-2018 - SysGauge v4.5 adds the ability to export system monitoring profiles to the XML format and then use the SysGauge command line utility to load the previously exported XML profiles allowing one to perform various types of system monitoring operations from batch files and shell scripts. In addition, the new product version improves the main SysGauge GUI application and fixes a number of bugs. 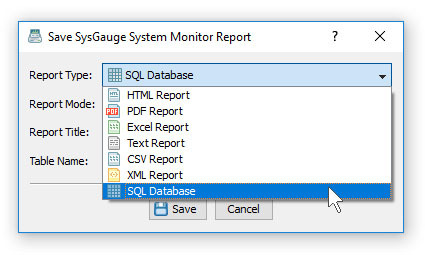 13-Mar-2018 - SysGauge v4.4 adds the ability to export complete system monitoring and process monitoring reports to an SQL database. In addition, the new product version adds the ability to switch between different types of monitors using the system tray menu, improves all types of system monitoring reports, improves the SysGauge command line utility and fixes a number of bugs. 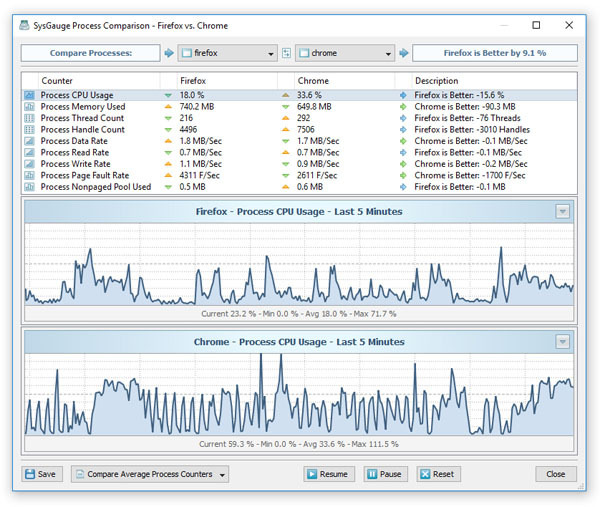 1-Mar-2018 - SysGauge v4.3 adds the ability to compare processes in real-time and display which process consumes more system resources including the process CPU usage, the process memory usage, the number of threads, the number of handles and the process data transfer rate. In addition, the new product version adds the ability to save process comparison reports, improves process monitoring reports, improves the SysGauge command line utility and fixes a number of bugs. 21-Feb-2018 - SysGauge v4.2 adds the ability to configure process monitoring rules allowing one to automatically detect processes consuming excessive amounts of system resources and then display process monitoring errors, play notification sounds, send E-Mail notifications and/or execute user-custom actions for processes consuming more than the user-specified amounts of the system resources. In addition, the new product version improves the process monitoring reports, improves the system status analysis operations and fixes a number of bugs. 12-Feb-2018 - SysGauge v4.1 adds the ability to define global system monitoring rules allowing one to analyze system monitoring results, check if user-specified system monitoring counters rise above or drop below valid ranges and then show errors, send E-Mail notifications and/or save system monitoring reports. In addition, the new product version improves the main system monitoring display, improves sound notifications, error E-Mail notifications and fixes a number of bugs. 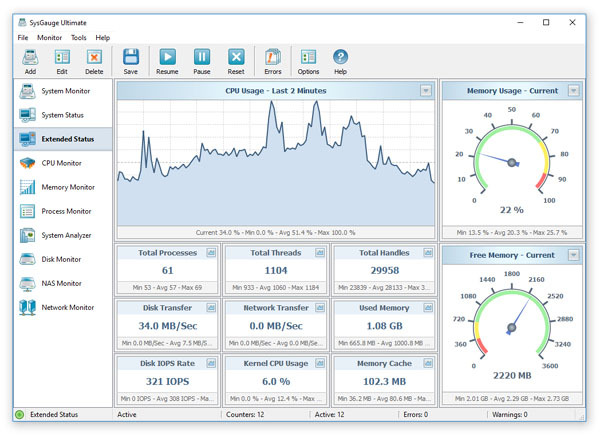 1-Feb-2018 - SysGauge v4.0 redesigns the SysGauge GUI application and adds dedicated system status monitor, extended status monitor, CPU monitor, memory monitor, process monitor, disk monitor, NAS server monitor and network monitor. In addition, the new product version adds advanced process monitoring reports, adds the ability to export monitoring data to an SQL database and improves the SysGauge command line utility. 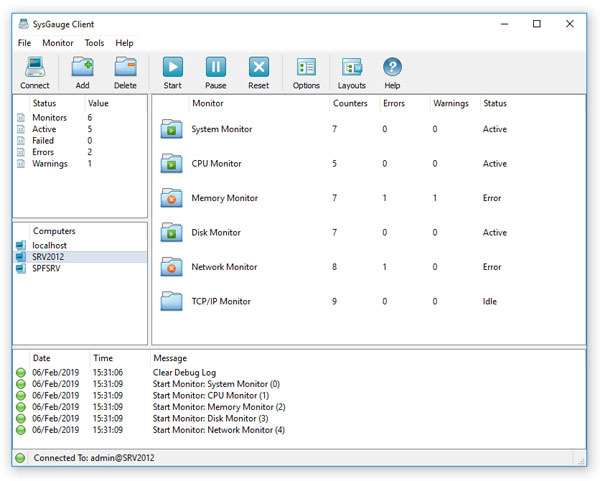 23-Oct-2017 - SysGauge v3.8 adds the ability to display the history of system monitoring errors, adds the ability to export the history of system monitoring errors to a text file, improves all NAS server monitoring counters, improves the main SysGauge GUI application and fixes a number of bugs. 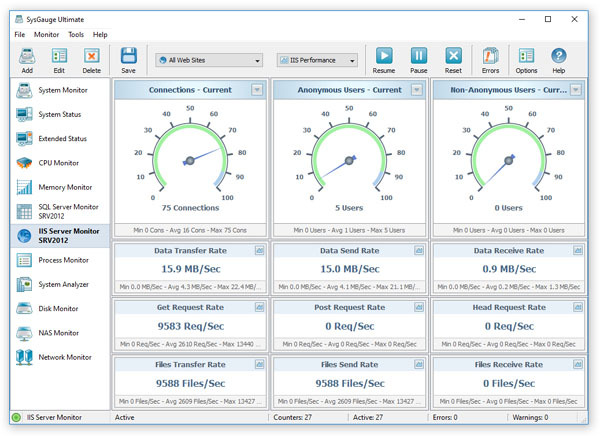 16-Oct-2017 - SysGauge v3.7 adds an extensive set of NAS performance monitoring counters allowing one to monitor the performance of Windows-based NAS servers including the NAS data transfer rate, data request rate, open file count, data queue length, average request size and the average request time. In addition, the new product version adds the ability to keep a history of system monitoring errors, improves all types of system monitoring reports and fixes a number of bugs. 4-Oct-2017 - SysGauge v3.6 adds the ability to automatically add conditional actions with sound notifications to a number of critical system monitoring counters including the memory usage, the disk space usage, the system errors counter, the total processes counter and the total threads counter. In addition, the new product version improves the main SysGauge GUI application and fixes a number of bugs. 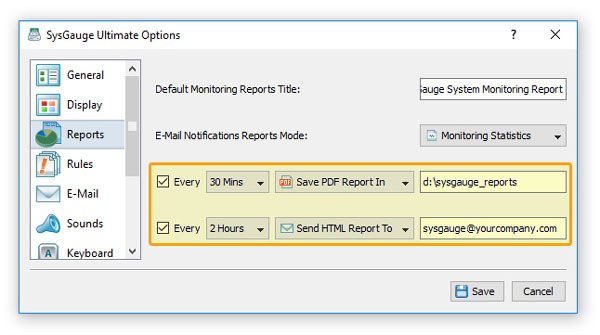 25-Sep-2017 - SysGauge v3.5 adds the ability to send E-Mail notifications with graphical PDF reports showing system monitoring statistics when one or more counters rise above or drop below user specified values. In addition, the new product version improves all types of system monitoring reports, improves the server-based product version and fixes a number of bugs. 18-Sep-2017 - SysGauge v3.4 adds the ability to execute custom commands or batch files when one or more system monitoring counters rises above or drops below user specified values. In addition, the new product version improves E-Mail notifications, improves system log actions and fixes a number of bugs. 11-Sep-2017 - SysGauge v3.3 adds the ability to control, configure and manage the SysGauge Server using the command line utility locally or via the network allowing one to automate the configuration and management of multiple servers. In addition, the new product version adds the ability to show system monitoring results and export/import the SysGauge Server product configuration using the command line utility and fixes a number of bugs. 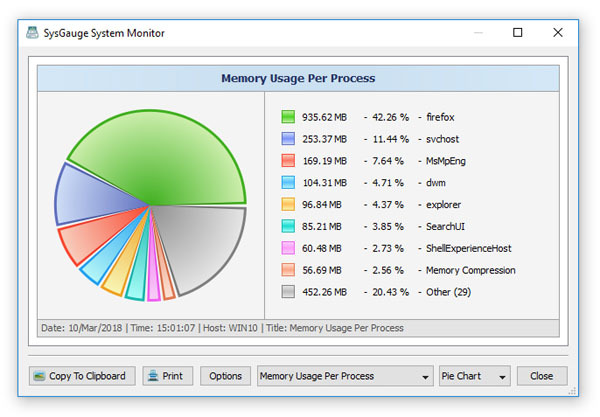 4-Sep-2017 - SysGauge v3.2 adds the ability to display pie charts showing the non-paged memory usage per process. 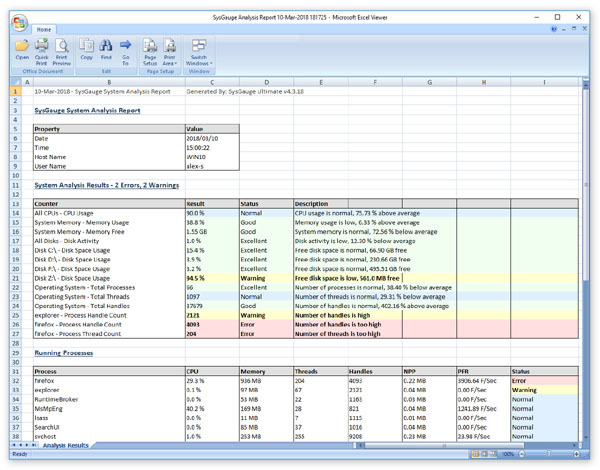 In addition, the new product version improves the Excel system analysis reports, improves the text system analysis reports, improves the main SysGauge GUI application and fixes a number of bugs. 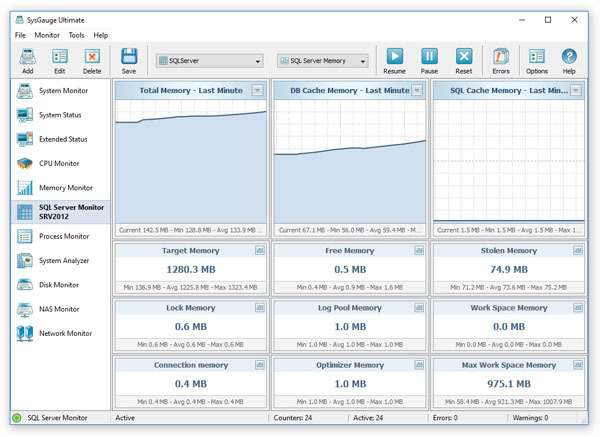 28-Aug-2017 - SysGauge v3.1 adds the ability to monitor the amount of system memory allocated from the non-paged pool and the number of allocations made from the non-paged memory pool. In addition, the new product version adds the ability to monitor the amount of system memory allocated from the non-paged memory pool per process and fixes a number of bugs. 21-Aug-2017 - SysGauge v3.0 adds a server-based product version, which runs in the background as a service and allows one to monitor one or more servers locally of via the network. In addition, the new product version improves all types of system monitoring reports, improves the main SysGauge GUI application and fixes a number of bugs. 29-Jun-2017 - SysGauge v2.9 adds the ability to monitor the number of active terminal sessions, the number of inactive terminal sessions and the total number of terminal sessions. In addition, the new product version improves the system monitoring counters dialog, improves the SysGauge command line utility and fixes a number of bugs. 22-Jun-2017 - SysGauge v2.8 adds the ability to monitor the CPU frequency and the percent of the maximum CPU frequency. In addition, the new product version improves all types of system monitoring reports, improves the main SysGauge GUI application and fixes a number of bugs. 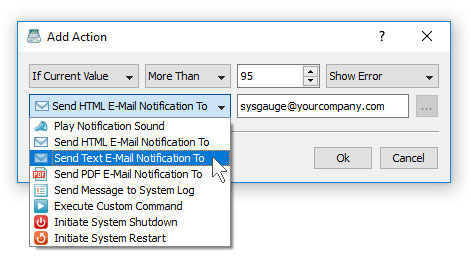 8-Jun-2017 - SysGauge v2.7 adds the ability to configure a number of global sound notifications and/or e-mail notifications to be sent when any of the system monitoring counters will rise above or drop below user-specified limits. In addition, the new product version adds the ability to send e-mail notifications to multiple e-mail addresses and fixes a number of bugs. 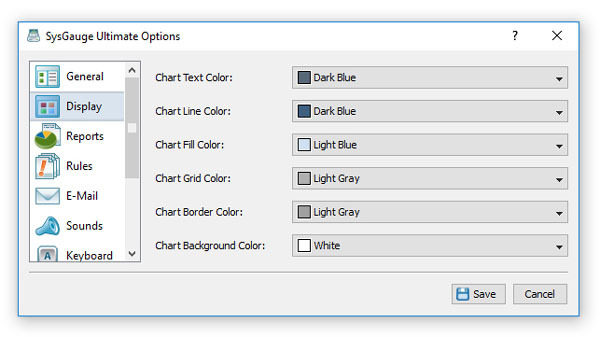 1-Jun-2017 - SysGauge v2.6 adds the ability to customize the chart text color, chart line color, chart grid color, chart border color and chart background color allowing one to change the appearance of the SysGauge main GUI application according to the user-specific preferences. In addition, the new product version improves the main SysGauge GUI application and fixes a number of bugs. 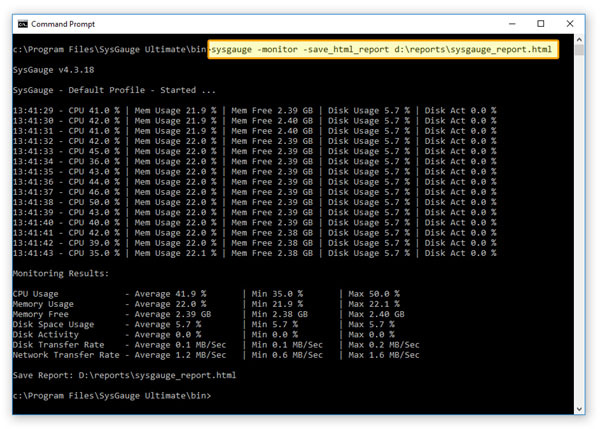 24-May-2017 - SysGauge v2.5 adds the ability to monitor the memory page file usage and the memory page file usage peak. In addition, the new product version improves all types of system monitoring reports, improves the system monitoring counters dialog, improves the SysGauge options dialog and fixes a number of bugs. 17-May-2017 - SysGauge v2.4 adds new performance monitoring counters providing the ability to measure the amount of time the CPU spends in the C1, C2 and C3 low-power states. In addition, the new product version improves E-Mail notifications, improves the SysGauge command line utility and fixes a number of bugs. 10-May-2017 - SysGauge v2.3 adds a command line utility allowing one to perform system monitoring operations, save various types of system monitoring reports, perform system analysis operations, automate profile and counter management operations, etc. In addition, the new product version adds the ability display the list of supported system monitoring counters and fixes a number of bugs. 3-May-2017 - SysGauge v2.2 adds the ability to send error messages to the system event log when one or more system monitoring counters rise above or drop below user specified limits. 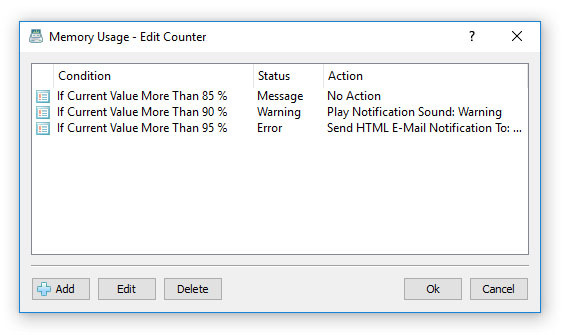 In addition, the new product version improves all types of E-Mail notifications and system monitoring reports, improves the main SysGauge GUI application and fixes a number of bugs. 21-Apr-2017 - SysGauge v2.1 adds the ability to keep a history of system analysis reports allowing one to view previous system analysis results and statistical charts. In addition, the new product version reduces the CPU and memory usage during monitoring operations, improves the main GUI application and fixes a number of bugs. 13-Apr-2017 - SysGauge v2.0 adds five user-selectable GUI layouts allowing one to display the current counter history chart and the counter list, all history charts and the counter list, all gauges and the counter list, all counters, gauges and history charts or only the counter list. In addition, the new product version improves the main SysGauge GUI application and fixes a number of bugs. 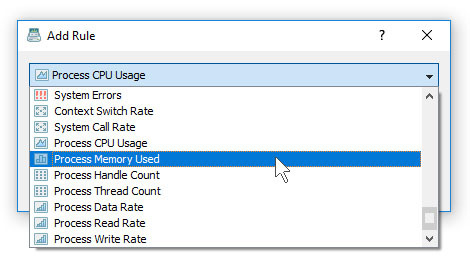 30-Mar-2017 - SysGauge v1.9 adds a number of advanced memory usage monitoring counters including the memory cache peak size, memory cache fault rate, memory page fault rate, memory page read rate and memory page write rate. In addition, the new product version improves the system status analysis capabilities, improves all types of system status reports and fixes a number of bugs. 22-Mar-2017 - SysGauge v1.8 adds the ability to monitor the CPU interrupt rate, the network packets rate, the number of error network packets, the number of discarded network packets and the network output queue length. In addition, the new product version improves the system status analysis capabilities, improves the SysGauge GUI application and fixes a number of bugs. 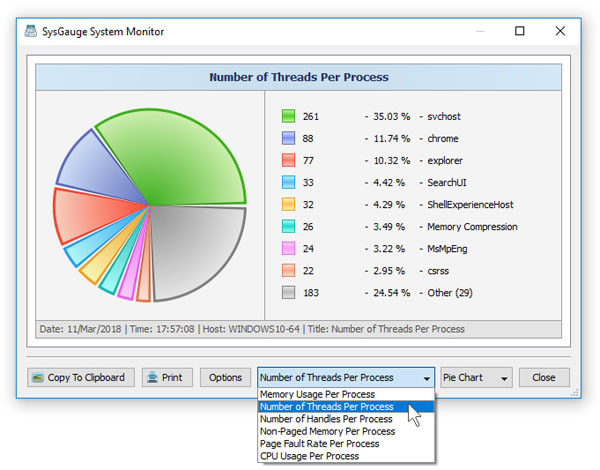 15-Mar-2017 - SysGauge v1.7 adds the ability to display pie charts showing the CPU usage per process, the memory usage per process, the number of threads per process and the number of handles per process allowing one to easily identify processes using excessive amounts of the system resources. In addition, the new product version improves the automatic system analysis capabilities and fixes a number of bugs. 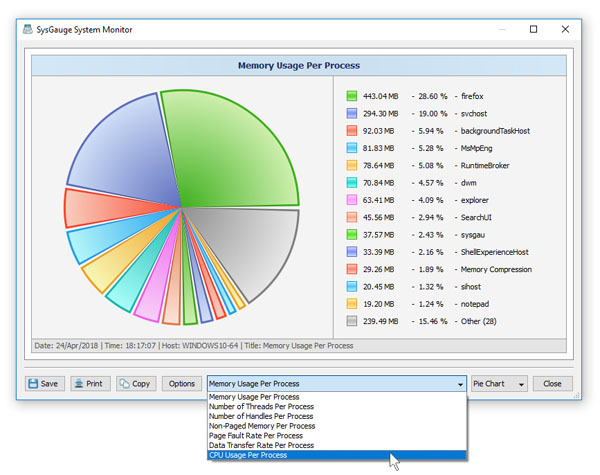 9-Mar-2017 - SysGauge v1.6 adds the ability to automatically analyze the status of all running processes and show processes using excessive amounts of CPU and memory resources. In addition, the new product version improves system status analysis reports, adds a portable product version, improves the main SysGauge GUI application and fixes a number of bugs. 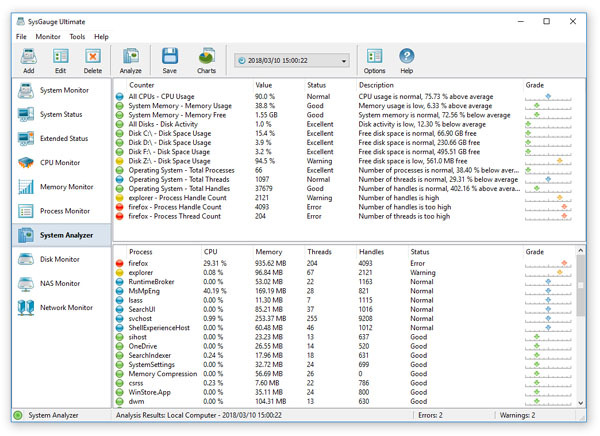 28-Feb-2017 - SysGauge v1.5 adds the ability to automatically analyze the current system status, check system resources including the CPU usage, memory usage, the operation system status and the disk space usage for all disks, detect all critical issues and show the user an easy-to-understand list of analysis results. In addition, the new product version adds the ability to save the system status analysis reports to the HTML, PDF, Excel and text formats and fixes a number of bugs. 21-Feb-2017 - SysGauge v1.4 adds the ability to monitor the disk space usage, the amount of the free disk space and the rate of disk split IOPS. In addition, the new product version adds support for multi-language and localized versions of the operating system, improves the fault tolerance of the system monitoring operations, improves the main SysGauge GUI application and fixes a number of bugs. 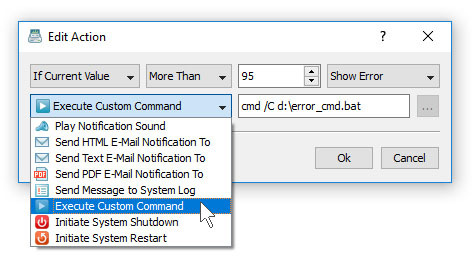 14-Feb-2017 - SysGauge v1.3 adds the ability to shutdown or restart the computer when one or more system monitoring counters rise above or drop below user-specified limits. In addition, the new product version adds up to 24 hours of monitoring history to all types of system monitoring reports, improves all types of system monitoring reports, improves periodic status reports and fixes a number of bugs. 2-Feb-2017 - SysGauge v1.2 adds the ability to schedule periodic system status reports to be saved in a directory at user-specified time intervals. In addition, the new product version adds the ability to schedule periodic status E-Mail notifications with an attached system status report to be sent at user-specified time intervals. Finally, the new product version adds graphical charts to the HTML system monitoring reports and fixes a number of bugs. 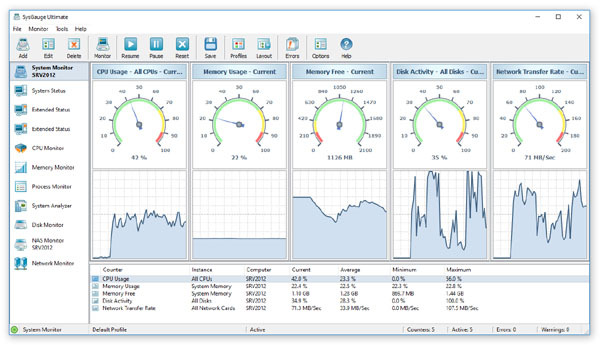 31-Jan-2017 - SysGauge v1.1 adds the ability to monitor the status and resource usage of running processes including the process CPU usage, process memory usage, process thread count, process control I/O transfer rate, process control IOPS, process data I/O transfer rate and process data IOPS. In addition, the new product version improves all types of system monitoring reports and fixes a number of bugs.